(Central Islip, N.Y., Feb. 2, 2015) – The three-time Atlantic League champion Long Island Ducks today announced the signing of outfielder and hitting coach Lew Ford. The former Major Leaguer returns for his sixth season with the Ducks and second as a player/coach. Ford put together an historic 2014 season with the Ducks en route to being named Atlantic League Player of the Year, becoming just the second player in franchise history to win the award (Ray Navarrete, 2009). He became the first player in league history to appear in all 140 games during the regular season and also broke the league record for hits with 189. In addition, he led the league in doubles with 40 and finished second in batting average (.347), RBI (95), runs (100), total bases (278) and on-base percentage (.415). The 38-year-old was selected to play in the Atlantic League All-Star Game in July and was named a Postseason First Team All-Star. 2014 also marked Ford’s first season in the coaching ranks of professional baseball. As Long Island’s hitting coach, he guided the Ducks offense to Atlantic League leading totals in batting average (.279), on-base percentage (.345), hits (1,360), walks (458) and at-bats (4,882). In addition, three Ducks ranked among the league’s Top 10 in batting average, including Ford (second, .347), Adam Bailey (seventh, .301) and Cody Puckett (eighth, .298). A native of Texas, Ford has spent five seasons with the Ducks (2009, ‘11-14), making him the longest-tenured active player with the Flock. 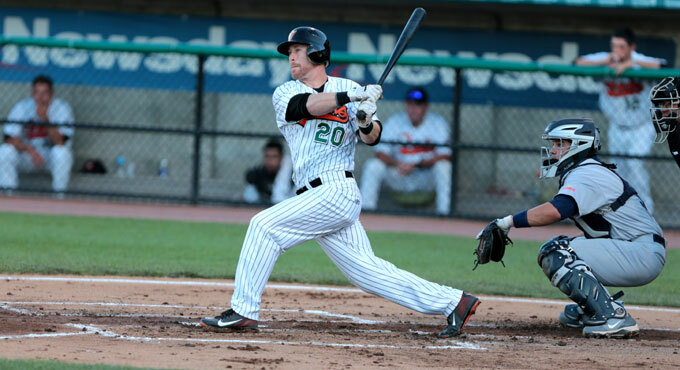 He is the franchise’s all-time leader in batting average at .337 and has played 341 games with Long Island. In that span, he has totaled 39 home runs, 216 RBI, 261 runs, 439 hits and 95 doubles. During his time with the Ducks, the former Boston Red Sox draft selection has helped the franchise to two Atlantic League championships (2012, ’13) and three Liberty Division championships (2011, ’12, ’13). Ford also became the 13th player in team history to return to the Major Leagues after playing with the Ducks, doing so in 2012 with the Baltimore Orioles. He has spent a total of six seasons at the game’s highest level with the Minnesota Twins (2003-07) and Orioles (2012).